Your business is one of the most important places to keep secure, controlled, and safe. The technicians at Country Lock and Key have your best interests in mind when providing service on your business location. Country Lock and Key offer affordable security solutions for everything from key control to lockouts. Since 1980, our team of security experts have delivered professional commercial locksmith services to state governments, county governments, local governments, retail shops, big corporations, real estate companies, small businesses, apartment complexes, housing complexes, restaurants, churches, medical facilities, schools, universities and numerous other commercial facilities. 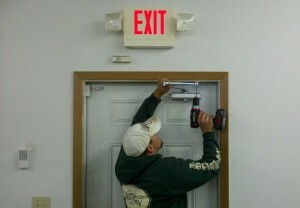 Deadbolt and high security locks are a good option for many business owners. High security locks enable you, the business owner or manager, to have complete control over who has keys made to your location. By utilizing this service, you will gain peace of mind that no duplicate keys will be made for your business without your approval. This also assists in long term costs. Typically, at the time of employee turnover, a location would need to be re-keyed. When an employee leaves, as long as you have the keys back, you know that no other keys have been copied and are in the wrong hands. If the keys are not returned, we are happy to come out and secure your location by re-keying the locks. Larger offices or multiple employees can benefit from master keying. This allows certain keys given out to work only certain doors, whereas another key may work all of the doors in a particular building or several buildings. A single employee can carry a key that opens the front door and his office, but keeps him out of other offices. The benefits of multi-level master keying are endless. Key Control,do you have it? 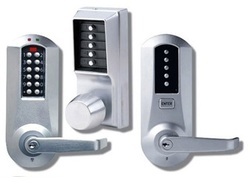 We have the High Security Lock Solutions! Medeco designed its high security product line with pick and drill resistance features that block the things thieves do to gain entry. When a thief sees Medeco locks on your interior or exterior doors, file cabinets, gates and other secure areas, he will likely decide it isn't worth the risk. Mul-T-Lock®’s High Security cylinders have a special telescopic pin tumbler mechanism with internal and external pins. Both the internal and the external shear lines must be aligned simultaneously in order for the plug to rotate. These features provide an added security dimension, amplifying the Mul-T-Lock cylinder’s pick-and-drill resistance for High Security needs. When master keyed, additional side pins or back pins can be incorporated.